GPA implements the fundamental concepts from the book, “The Leader In Me”, by Stephen Covey. 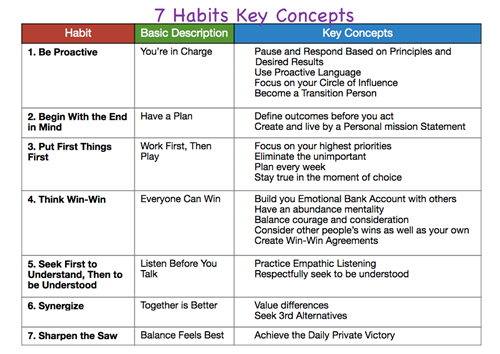 At GPA, we practice the 7 Habits: 1. Be proactive – You’re in charge, 2. Begin with the end in mind – Have a plan, 3. Put first things first – Work first, then play, 4. Think Win-Win – Everyone can win, 5. Seek first to understand, then to be understood – Listen before you talk, 6. Synergize – Together is better, and 7. Sharpen the saw – balance feels best. Global Preparatory Academy is a tuition-free, community school of choice for grades K–6. We are AdvancED Accredited. In an effort to compete in an ever-changing society, our staff embraces students, families, and communities to build and develop well-rounded individuals who are independent, critical thinkers motivated intrinsically to continue as life-long learners who excel in higher education and are the leaders of legacies. Global Prep is an awesome school! The administration listens to parents and students concerns. Teachers really care about their students! This school is focused on our childrens' academic career. Changes may occur but they have been for the best. Teachers are always reachable and show true concern during the school day and after! Our children come first at GPA! Academics, Clubs, Programs, Tutoring, Homework Help, Parenting Resources, Small Classes. Looking for all of this plus more? Global Preparatory Academy is the school for you!